Have you checked out the DIY SUGAR SCRUB I had up last week? It smells divine! This week I have for you probably one of the best kept secrets in skin care. 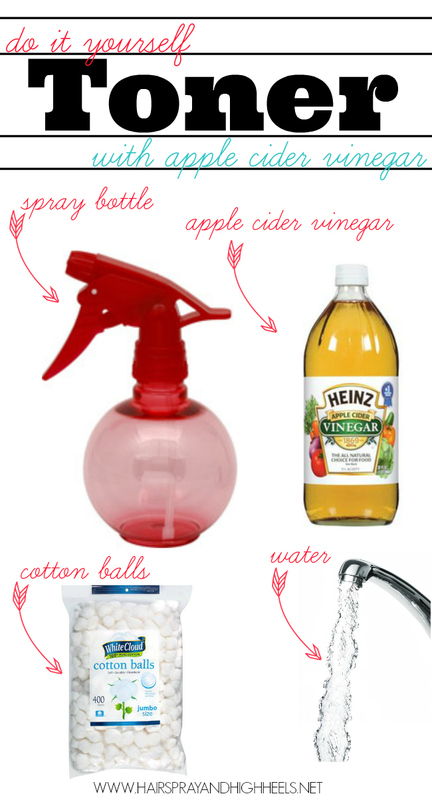 Today, we’re dishing on Apple Cider Vinegar Toner DIY. I don’t know about everyone else, but I have struggled for a long time, in search of the perfect toner and nothing quite worked the way it said it would. Finally, I asked my dermatologist if she had any recommendations and what she shared with me shocked me. I could actually use something from the grocery store and get pretty good results. I was intrigued so I tried it out, that was about 4 years ago and I have to say, no matter what, I still go through different toners from different brands but I always come back to this little gem. How amazing is it that you can use something as trivial as apple cider vinegar as a toner? Awesomesauce! Using Apple Cider Vinegar as a toner can help improve your complexion, keep your skin feeling soft, fight off blackheads and breaks outs as well as restore your skins natural pH balance. Apple cider vinegar used as a toner has also been known to help with redness and blemishes on the skin. 1| Mix 1 part ACV for every 2 parts water to fill your spray bottle. 5| Continue your skin care routine as usual. 1| Store in the fridge for a refreshing cooling effect. 2| If you’re blotting with the cotton balls, do it and *upward & outward* motion. It’s that easy! This DIY apple cider vinegar toner will leave your skin glowing after each use, it will help to lock in moisture from your other products. I usually buy the vinegar from the supermarket to use for my facial toner because I use it for other things as well but if you’re looking for something more organic you can check out Whole Foods and grab it there but I’ve found the same results with a cheap $1 bottle at Walmart. When mixed 1 part vinegar to 1 part water you can use it as a hair rinse. I’m inviting you to join my international giveaway! I will definitely be trying this! I love finding little tricks like this! I’ve been using ACV on my face for about 7 months now. It’s amazing!!!! Great idea! I have just starting using all natural things on my skin. So this will be perfect. Ohh I have never heard of it for weightloss, interesting! They’re some of my favorite!! I’ve actually got your post pinned! It’s the best isn’t it? thanks! going to try this on my face today. btw…isn’t the polaroid picture song from Outkast?? ?